Much volatility was seen in the markets last week with a lot of themes developed. Canadian Dollar ended as the strongest one as strong data boosted chance of August BoC hike. Swiss Franc followed as the second strongest on risk aversion in Europe. Dollar was original set to perform better as trade tension escalated again. But it only ended as the third strongest after Chinese intervention in Yuan, as well as mixed non-farm payroll report. Meanwhile, Sterling was the worst performer after dovish BoE hike. Euro followed as second weakest as it’s a casualty of US-China trade war. Canadian Dollar ended as the strongest one last week with support from optimism in the economy, as well as progress in NAFTA renegotiation. GDP grew an impressive 0.5% mom in May, with broad-based strength. 19 out of 20 industries reported growth, except utilities. Further than that trade data released on Friday also showed resilience, with 2.1% jump in export in volume terms. And more importantly, the June data revealed that after steel and aluminum tariffs by US came in to effect, steel exports dropped -37% mom while aluminum export dropped -7%. Growth elsewhere were more than enough to offset such contraction. There was some jitter for Canadian Dollar as the country was kicked out of the bilateral NAFTA talks between the US and Mexico. Traders initially took that as a negative but could have later changed their mind. There appeared to be some concrete progress between the US and Mexico. Mexican Economy Minister Ildefonso Guajardo declared on Friday that major stumbling blocks were cleared. And, he added that “technically, we are ready to move into finishing the issues, Mexico-U.S. issues, the most next week. There are very good probabilities that we’ll be landing solutions.” Also Guajardo said there could be a deal before end of August and Canada could jump in any time to make it trilateral. The markets are now seeing around 75% chance of another rate hike by Bank of Canada in October. From intermarket correlation point of view, weakness in oil price could be a factor that holds the Loonie back. Nonetheless, while WTI crude oil struggles to regain 70 handle on recovery, it’s just hovering around a flat 55 day EMA. And based on diminishing downside momentum as seen in daily MACD, even in case of another fall, downside will likely be contained by 38.2% retracement of 42.05 to 75.27 at 62.58 to set the range. Sterling ended as the weakest one last week primarily due to the dovish rate hike by BoE. The decision to raise the Bank Rate by 25bps to 0.75% matched general market expectations. The unanimous 9-0 vote at first looked hawkish with doves giving in. But at a second glance, it’s indeed the result of compromise that the next hike is quite distant away. The most important part of the announcement was found in the quarterly Inflation Report. There, BoE used a conditioning path that implied Bank rate will hit 0.9% in Q4 2019 1.1% in Q4 2020 and stay there till Q3 2021. In May’s conditioning path, the Bank rate will reach 1.0% already in Q3 2019, and then 1.2% in Q3 2020 and stays there till Q2 2021. That is, the current path argues that the next hike could happen in Q1 2020, instead of Q3 2019. And there could be no more rate hike in the forecast horizon. Also, with such conditioning path, GDP (exclude backcast) is projected to growth faster by 1.5% in the four-quarter to Q3 2018, and 1.8% in the four-quarter to Q3, 2019. But GDP growth in the four-quarter to Q3 2020 is unchanged at 1.7%. Inflation will return to target later at 2.0% in Q3 2021, instead of Q3 2020. But, at 2.2% in Q3 2019 and 2.1% in Q3 2020, it’s reasonably close to target. The dovish message was further affirmed by BoE Governor Mark Carney during the press conference. Carney said that tightening would be gradually as “structural factors that have pushed down the trend equilibrium real rate are likely to persist.” It will be limited because “domestic short-term factors (particularly headwinds from uncertainty and fiscal drag) will fade slowly.” Also also R* is expected to rise only gradually, and “policy needs to walk – not run”. Euro ended the week as the second worst performer while Swiss Franc was the second biggest gainer. Such could be explained by risk aversion in the European markets. DAX gapped sharply lower on Thursday after disappointing results of Siemens and BMW. Escalation of trade tension between US and China also weighed on sentiments. DAX’s choppy rebound could have completed at 12886.83, well ahead of the falling trend line resistance. As pointed out last week, the index is seen as bounded in consolidative trading in converging range since 13596.89. The close below 55 day EMA now puts near term focus back to lower trend line support (now at 12270). Break there will pave the way down, possibly through 12104.41 support. And such development would weigh on EUR/CHF further. There were a lot of false expectation on BoJ but all were cleared after Governor Haruhiko Kuroda’s strong message. Kuroda said with emphasis that there were some speculations that BoJ could seek an “early exit” from ultra loose monetary policy. And he hoped the strengthening of the framework can “dispel such speculation. In short, BoJ widened the target on 10 year JGB yield from near 0% to a 0.2% band from -0.1% to 0.1%. The objective was to “improve functions in the government bond market, which had been deteriorating” and “help make our easy-policy more sustainable”. Additionally, he also admitted that it takes “longer than expected” for inflation to pick up. Hence, “achievement of our target will be beyond our (three-year) forecast timeframe”. Now back to US-China trade tension. US raised the stakes last week by announcing the intention to impose 25% tariffs on USD 200B in Chinese imports, instead of 10%. There is no effective date yet. In a some what delayed fashion, China announce on Friday that impost additional levies on 5207 US products, totalling around USD 60B in value. Additional 25% tariff will be imposed on 2493 products, additional 20% on 1078 products, additional 10% on 974 products and additional 5% on 662 products. The effect date is to be determined. The effective date will depend on US imposition of respective tariffs. While there were rumors of re-engagements, we’d like to emphasized that the situation has already developed in to something more than a trade war. The biggest development last week should be the passage of USD 716B spending bill in the Congress. The bill will strengthen US defence in Indo-Pacific region and take a number of restrictive measures against China. It would also equip the so called Committee on Foreign Investment in the United States to handle national security threats posed by investments. In short, we’re seeing no reason for Trump to back down from trade war with China. The domestic objections on it could fade as time goes by should the general anti-China sentiments increases. Moreover, resolving the trade dispute with the EU and NAFTA countries should also ease much of the concerns on trade war in a global scale. If it’s just about China, it’s much easier for Trump and his hawks to persist on it. It’s just the beginning of the beginning. The Chinese Yuan suffered renewed selling over the week with USD/CNH (off shore Yuan) hitting as high as 6.9126. That prompted the People’s Bank of China announcing to raise the FX risk reserve ratio of forward sales from 0.% to 20%. That’s effective a measure to curb capital outflow and stabilize the falling Yuan exchange rate. USD/CNH then dipped back to close at 6.840. It’s seen as a major factor that triggered the late pull back in Dollar and lifted Aussie and Kiwi from the week low. Meanwhile, we’ll have to wait till Monday to see if the announce could halt the fall in China SSE, ahead of 2700 key level again. US treasury yields probably topped and is reversing. Retreat in US treasury yield is another factor that’s limiting Dollar’s rally, and in some way held lifted Japanese Yen (with strength in JGB yield in the back ground too). Friday’s sharp fall in five year yield apparently suggests that it has topped out in near term at 2.887. Immediate focus is back on 55 day EMA (now at 2.778) this week. Firm break there will also suggests that rebound from 2.571 has completed at 2.887, and would target 2.695 support for confirmation. The correction pattern from 2.951 could eventually have a take on 38.2% retracement of 1.618 to 2.941 before completion. The picture in 10 year yield was less concrete. Still, immediate focus will also be back on 55 day EMA (now at 2.911). Firm break there will likely start the third leg of the corrective pattern from 3.115. And TNX could have a test on 38.2% retracement of 2.033 to 3.115 at 2.701 before completing the correction. While Dollar index rebounded, there is no convincing momentum for upside breakout yet. All will depends on whether EUR/USD will dive through 1.1507 low. At this point, EUR/USD is in favor to do so. 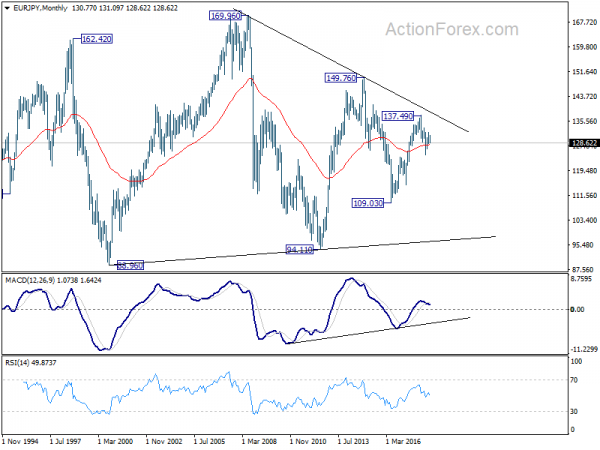 Thus, there is realistic chance of DXY breaking 95.65 high this week. In case of another fall as recent consolidation extends, we’d continue to expect strong support from 38.2% retracement of 88.25 to 95.56 to contain downside. We’ve entered GBP/CHF short again 1.2971 last week and it’s so far developing as expected, even though downside momentum is not satisfying. We’d expect Sterling to stay soft after last week’s dovish BoE rate hike. Additionally, risk aversion in European markets could continue to help support the Swiss Franc. Hence, we’ll stay short in GBP/CHF, with a stop at 1.3040. 61.8% projection of 1.3854 to 1.3049 from 1.3265 at 1.2768 as first target. And there is prospect of extending to 100% projection at 1.2460 in medium term. Additionally we’re expecting more weakness in Euro too. It’s for ceratin that Eurozone economy is slowing down. And, it seems like businesses are starting to feel the impact of US-China conflicts. ECB’s policy path is set until through next summer and there is no reason for it to pull ahead the moves. Technically, EUR/USD’s breach of 1.1574 is the first sign of downside breakout. 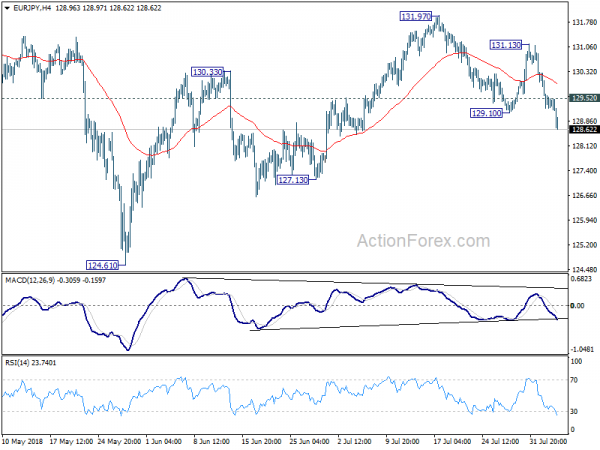 EUR/JPY’s break of 129.10 confirms resumption of fall from 131.97 and revived the case of near term reversal. 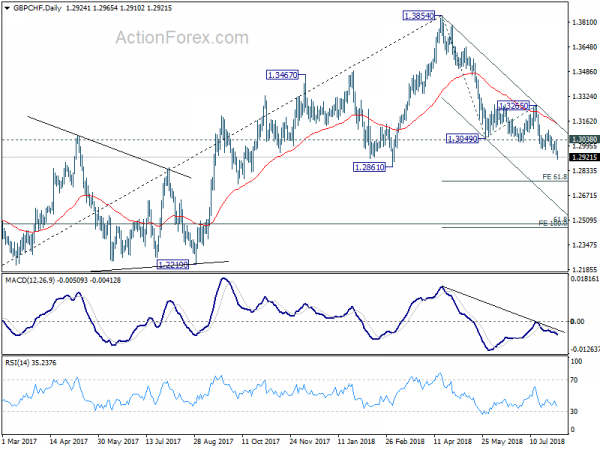 EUR/CHF took the lead in near term bearish reversal earlier. EUR/AUD’s break of 1.5651 also indicates near term bearish reversal. EUR/CAD is likely extending the fall from March high at 1.6151. So the question is, if we’re going to sell Euro, which currency would we choose. As we have GBP/CHF already, we’ll avoid Swiss Franc. Sterling is itself rather bearish and EUR/GBP is struggling in range. So the pound is out of question. Dollar could be a good candidate, if not for reversal in treasury yield. Thus, there could be more Chinese intervention in USD/CNH. So we’d avoid Dollar. 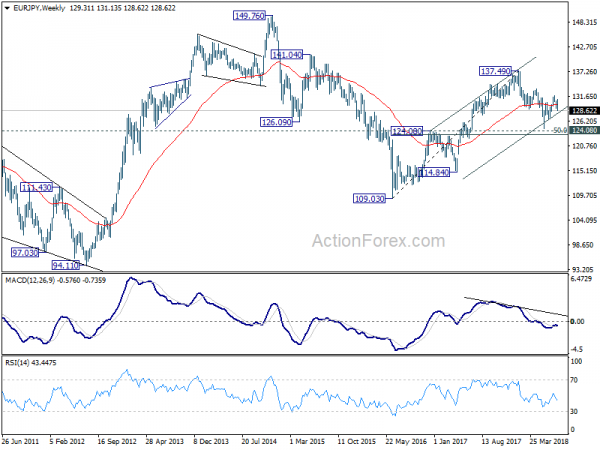 Australian Dollar looked resilient and EUR/AUD is now near term bearish. But remember that Chinese stocks are in serious down trend. They could eventually drag down Aussie. Hence, it’s a “no” to AUD. Finally, we’ll choose Yen over Canadian Dollar. Firstly, JGB yield stood tall after BoJ triggered volatility. Secondly, further weakness in oil price could hold back Loonie’s strength. Hence, we’ll sell EUR/JPY at market this week with a tight stop at 129.60, slightly above 129.52 minor resistance. 127.13 is the first target but we’d expect at least a test on 124.61 low. The rebound to 131.13 last week was brief. 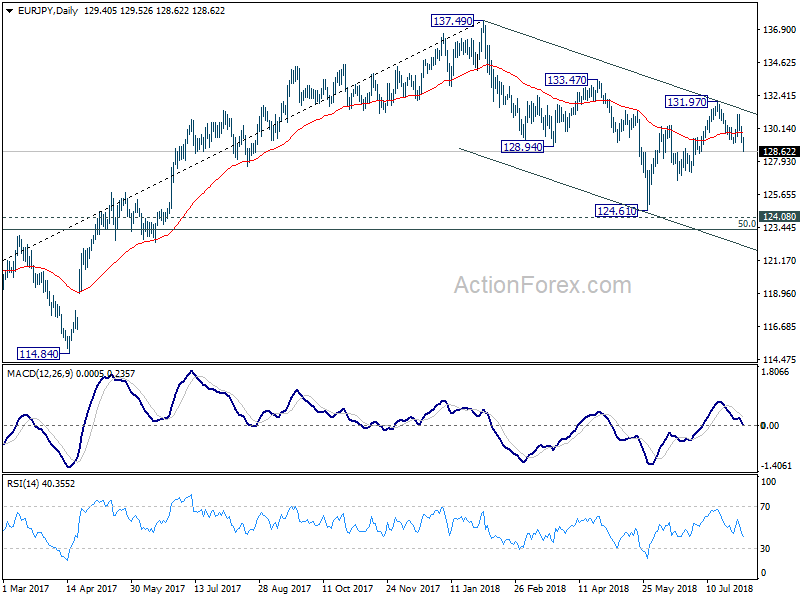 EUR/JPY drops sharply since then, through 129.10 support to close at 128.62. The development revives the case that corrective rebound from 124.61 has completed with three waves up to 131.97. Initial bias stays on the downside this week for 127.13 support first. Decisive break there will bring retest of 124.61 low. On the upside, above 129.52 minor resistance will turn intraday bias neutral first. But near term outlook will remain cautiously bearish as long as 131.13 resistance holds. In the bigger picture, for now, EUR/JPY is still holding above 124.08 key support turned resistance. And the larger rise from 109.03 (2016 low) mildly in favor to resume. Break of 133.47 should send the cross through 137.49 high. However, decisive break of 124.08 will confirm medium term reversal and could then pave the way back to 109.03 low and below. 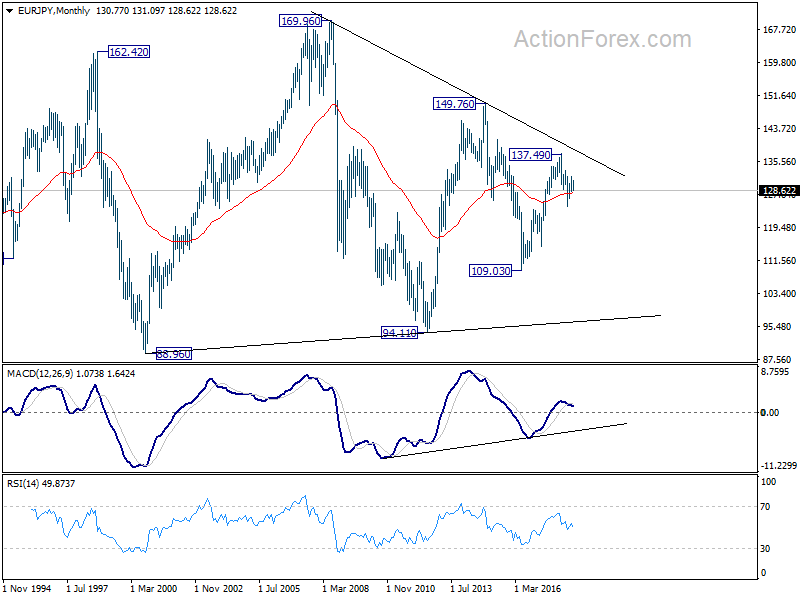 In the long term picture, at this point, EUR/JPY is staying in long term sideway pattern, established since 2000. Rise from 109.03 is seen as a leg inside the pattern. As long as 124.08 support holds, further rally is in favor in medium to long term through 149.76 high. However, break of 124.08 could extend the fall through 109.03 low instead.